20 Videos by ARCWP Women Priests for WOC Women Called- "What I want the world to know about my call to priesthood"
Arise and walk forth, you poor, you poor in spirit, oppressed, and powerless. The kingdom of God is yours! Keep on going; don’t be discouraged by your poverty or powerlessness. Arise and walk forth, you who mourn. You will be comforted! Keep on going; grieve, but keep organizing, seeking justice and making peace. Arise and walk forth, you who are nonviolent, gentle, and meek. You shall inherit the earth! Keep on going, don’t be overwhelmed by the world’s violence. Practice creative nonviolence and become one with creation. Arise and walk forth, you who hunger and thirst for justice. You will be satisfied! Keep on going; don’t give up the nonviolent struggle for justice. Arise and walk forth, you who are merciful to everyone. You will receive mercy! Keep on going; be instruments of mercy in a merciless world. You can never be too merciful, too compassionate, or too forgiving. You will experience the mercy of God. Arise and walk forth, you who are pure in heart. You will see the God of peace and love! Keep on going. Let God disarm your heart; cultivate interior nonviolence; create a space for the God of peace and love to dwell within you. You will see everyone as your brother and sister, and God everywhere. You will find God in all things. Arise and walk forth, you peacemakers! You will be called the sons and daughters of the God of peace! Keep on going, even though everyone else supports war, killing, nuclear weapons, and violence of every kind. Don’t give up. Make peace, end wars, teach nonviolence, build peace movements, advocate for a new world without war, reconcile everyone, and welcome my resurrection gift of peace. Be who you already are, the beloved sons and daughters of the God of peace! Arise and walk forth, you who are persecuted for working for justice! The kingdom of God is yours! Keep on going. Don’t give up, even though others reject, harass, denounce, and turn against you. You are truly my disciple! For I too was persecuted for working for justice. I too was rejected, harassed, even arrested, condemned, tortured, and executed. In a world of injustice and permanent war, anyone who works for justice and peace will be persecuted. But you keep going, in a spirit of peace, love, and nonviolence, forgiving those who hurt you, praying for your persecutors, and trusting in the God of peace to welcome you into God’s kingdom of nonviolent love. Arise and walk forth, you who are insulted, persecuted, and slandered because of me! Rejoice and be glad, for your reward will be great in heaven! Keep on going, for you have joined the lineage of the holy prophets of old, Isaiah, Jeremiah, Ezekiel, and the rest. Now you have become one of the holy prophets of your own time. You join the lineage of peacemakers, including Mahatma Gandhi, Dorothy Day, Martin Luther King Jr., Rosa Parks, Oscar Romero, Franz Jägerstätter, and Cesar Chavez. This is your opportunity to make peace, love your enemies, and trust God. Now you get to practice nonviolence and show everyone what it means to be my disciple. Through your loving nonviolence, my holy spirit will disarm others and help disarm the world. While pundits debate whether a Supreme Court that includes Brett Kavanaugh will overturn Roe v. Wade, a group of progressive clergy isn’t waiting to find out. 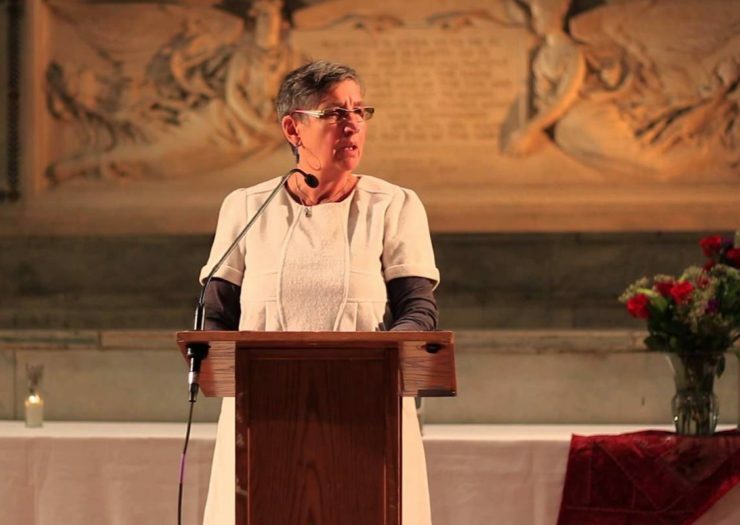 These religious leaders have been planning for life after Roe for the past year.